One of the biggest questions I’ve been asked recently is surrounding which is the best smart lock. The answer to that is tough because there are so many on the market, but I’m going to do my best to answer the question here. I’m going to discuss the top 4 smart lock providers in this article and get you steered in the right direction. At the time of writing this, the 4 best smart locks are. As we get further into this subject you’ll quickly see that they are not all made the same, nor do they do the exact same thing. Smart Locks have become a staple in any smart home, and if you haven’t thought about getting a smart door lock for your home then you might be running behind the times a bit. You can find smart locks in many homes that are being built these days. It’s not uncommon for a homeowner to add a smart lock so that they can control and monitor all the activity coming and going from their abode. The best part is, you can control it remotely from anywhere in the world. People are renting vacation homes more and more now. So it is much easier to control the comings and goings of these homes. Basically, you just give the tenant their own code and once they leave the property (for whatever reason) you can delete that code along with their access. This is especially handy if you have short term renters or if you hire a construction crew which you only need for a short time. One of my best friends has been a locksmith for over 40 years and repeatedly over the years, he has told me that Schlage makes the best locks generally speaking. So I’ll put that out there right out of the gate. However, I have handpicked some smart door locks with his assistance that are guaranteed to help secure your home’s belongings and the people in it. I’ve also spent a lot of time going through buyer feedback and will give mine as well where it’s most pertinent. A smart door lock is an electromechanical lock which either uses Bluetooth or wifi connectivity to interact with other devices. Typically a hub or a smartphone depending on how you have it set up. Typically there are two ways this works. You can either put the app for the specific lock on your smartphone and open the door when you are close in proximity or some come with a fab that will allow you to open the door as well. If you need someone to feed your pet while you are gone, then one key feature that most smart locks come with is that you can give someone a temporary key. Once you give them the temporary key then they can open the lock using their phone. When you return home their key is invalidated. So they can’t regain access. This is your home security we are talking about here and I take that very seriously. There are only a very few trusted manufacturers that I feel I can even mention in this article. My promise to you is that I have been very careful in reviewing these products and understand the sensitivity of having it connected to your home. So, with all that said, let’s get right into the pros and cons of the few select smart locks that I have chosen to discuss here. Schlage became a company in 1920. That’s almost 100 years. Once Schlage started creating smart home products (around 2013 when they became a part of the Allegion family of brands) their part in the smart home revolution has really shown through in their constant upgrades to existing hardware. Schlage has created some of the most solid smart home locks and is considered the best in breed for today’s smart lock market. Lets talk about two of their best performing smart home locks, the Schlage Sense and Schlage Connect. If you are looking for a smart deadbolt that has a mix of technology, security, and quality then the Schlage Sense Smart Deadbolt is possibly one of the best options for a smart lock. I understand that smart locking features and security isn’t the only thing that matters for a lot of people. Schlage Sense has an elegant design, which will look nice on any home. Schlage Sense comes with a Grade 1 lock to give you the best security when upgrading your existing lock. There’s a built-in alarm integrated as well, which will chime when the door is opened or closed regularly. But if the door is forced open there is an extremely loud alarm that is set off. Schlage Sense gives you the option of two different designs, the Century trim, and Camelot trim. The Schlage Sense is a clean looking lock with a very vibrant and new feel with it’s illuminated screen. The thing about the screen that I found handy is that it makes it much easier to see when you are coming home late at night. It also has a traditional keyhole in case the battery dies on you or you forget your code. The Schlage App: Schlage Sense will pair up with your phone using Bluetooth and comes with its own Schlage Home App, which is available for both Android and IOS. If you want to check your locks status you just pull up the app and you can access it through the wifi in your home. One awesome feature is that you can create multiple user codes through the app, that’s a pretty handy feature when you want to give access to a housekeeper for the day. Installation: Even if you aren’t used to installing locks. The installation of the device is fairly easy. The instructions it comes with are very clear and they walk you through the entire process of setting it up. In our case we just needed a few minutes and a screwdriver. Once everything is lined up, you’re done and you’ve replaced your old deadbolt. The free app that it comes with works well. Even though Schlage Sense is a little more pricey than I’d like to see. The prices on these are slowly coming down a little. I still find it one of the most cost-effective solutions if you want a smart lock that will last. If you are interested in seeing more reviews on the Schlage sense, you can check it out over here on Amazon as well. Here again, the Schlage Connect Smart Deadbolt lock is another reliable solution for your home. Schlage has been known to use top quality material and is one of the most trusted lock manufacturers in the world. Their smart locks are no different. It’s security features combined with its overall classy look is what really makes it one of the best smart locks. Just like the Schlage Sense, you’ll find that the Schlage Connect also comes in the Century and Camelot trims. It’s also available in five finishes, Satin Nickel, Matte Black, Bright Chrome, Bright Brass, and Aged Bronze. It also has three different styles. Traditional, contemporary, and transitional. It is powered by 4AA batteries and operates in temperatures of -31 to 150.8 degrees Fahrenheit. If you are concerned about set up, then I think you will find this lock very easy to install as well. Once you’ve finished the installation you can start programming codes right away without even hooking it up to your smartphone. The hitch is that the Schlage Connect doesn’t come inherently with its own app. However, you have to connect it to your smart home hub in order to control it remotely. So once you’ve set it up with your smart home hub then programming the lock is rather simple. I was really impressed by the way that the sensors for the Schlage connect could detect any little sound on the door. Again, just like the Schlage Sense, you can have up to 30 user access codes to have keyless entry into your home. You can also give out temporary access codes to a friend or a family member coming over to feed your dog. If you’d like to check out more about the Schlage Connect Deadbolt you can find out more over here on Amazon. Nest is one of those smart home companies that just keeps getting better. 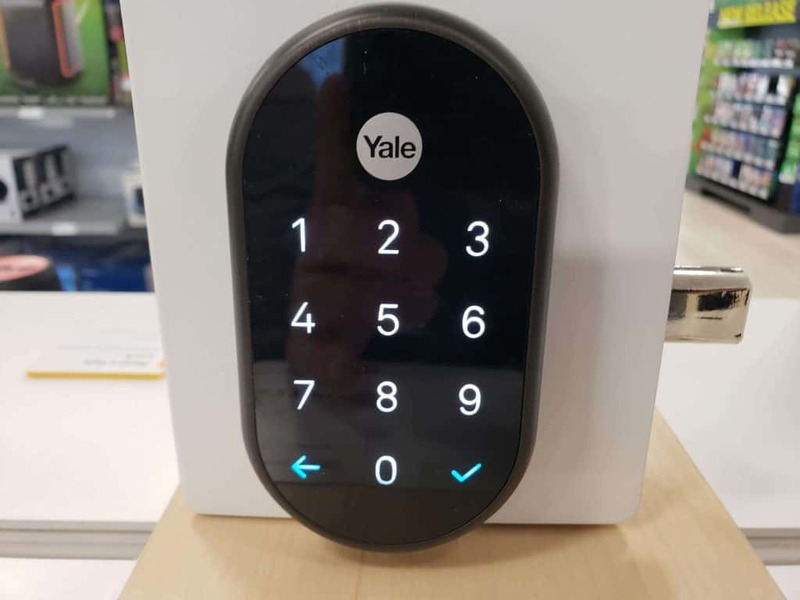 The fact that they are working with Yale to integrate into a smart lock means that you’re getting the ultimate combination of smart home features and rock solid security in one package! Nest x Yale has some awesome features too! For example, one-touch locking, auto locking, and a timeline that shows you exactly who has locked and unlocked the door throughout the day. Installation is a breeze, and I highly recommend this if you are already using other Nest smart home devices. Design: The Nest x Smart is unique in its design as the black glass front gives way to soft led tones that are vibrant across the keypad. You can get it in Satin Nickel, Polished Brass, and Rubbed Bronze finishes. It has two built-in fail-safe terminals in case the batteries die as well. Installation: I think you’ll find the installation really quite easy. The instructions are very clear and once installed it takes 4 AA alkaline batteries. Once you have a master pin code set, it allows you to pair the device with the Nest app. The one big limitation is that it needs to be connected to a smart hub to pair with other nest devices. But there are other ways to get around that through the Nest Connect app. Features: Keyless access is an awesome feature, but it also comes with the feature of being after to invite a friend when you aren’t home. You can assign a virtual key to any friends or family members and also allows you to control when they have access to your home. Nest x Yale gives you auto locking capabilities that will automatically secure your home. Just in case where you forgot to lock the door (it’s happened to me). You can also set the specific time before it locks automatically, which is just another added feature of control. Nest x Yale uses 4 standard double A batteries and notifies you of a low battery. That way you don’t get locked out by accident. When the batteries start getting low it will notify you on your smartphone or in the Nest Connect App. One other thing to note is that if the batteries are running low it will show a red, low battery light when you unlock it and it’ll sound off an alarm that would wake up the dead. Technology: Weave is the technology that Nest has used to integrate all of its different smart home products. The great thing about weave is that it allows all Nest devices to still talk to each other even if there is a power outage or in a case where you lose your internet. Remote Control: The Nest x Yale does allow you to connect to your home remotely. However, Nest Connect or Guard are the two apps that allow you to connect remotely and are a necessity if you plan on doing this. Access codes: Nest x Yale can give you up to 20 access codes. You can then give out the codes as you see fit to friends, family or your housekeeper. Door Sense Technology: Nest x Yale’s biggest problem is integrating with the sensors from the Nest Secure. I’ve seen a few people report online that their Nest x Yale locks automatically even when it’s not closed. Privacy Mode: The Privacy mode in Nest x Yale offers a way to set schedules for different users. Keypad: Nest x Yale smart lock has a keypad that you can use for code entry. It allows up to 20 access codes at any given time. Built-in alarm: Nest also gives you the ability to be alerted if someone is trying to set off the alarms by tampering with your security. This is a handy feature because the notifications are sent directly to your phone. That way you can take the appropriate action to protect the people and belongings in your home even if you are not home. Smart Home Integration: Nest has never been the most friendly when it comes to integration with other devices. It will work with other Nest products with no problem at all. But for compatibility, this is probably not my favorite to say the least. If you’d like to find out more about the Nest X Yale, you can check out all the reviews over here on Amazon as well. The various smart locks at affordable prices offered by August, make them a preferred brand of smart lock for most homeowners who want to control their locks or monitor them when they can’t be there. So, I’ll cover the August Smart Lock- HomeKit enabled, and the August Smart Lock Pro. Two of my personal favorite smart home locks out there right now. But for two different reasons, which I’ll get into in a minute. If you are renting a home and your landlord doesn’t want you changing the locks (which is usually the case). Then August Smart Lock, HomeKit enabled is probably the best solution to upgrade an existing deadbolt. The biggest difference with this lock is that it allows you to keep your existing deadbolts and hardware in place. The only piece that you’ll actually have to change is the turn latch on the inside of the door. Design and features: August smart locks give you a space-age round looking design. They look like something Nasa designed, but very stylish at the same time. You can find them in both silver and a dark gray finish. What’s in the box? : August has an LED indicator that will change from red to green once you open or close the door. The HomeKit feature requires you to use any apple device. Such as an iPhone, Ipad, Ipod, or Apple TV in order for you to be able to use it. One nice feature is that it is capable of being used with IFTTT. Four AA batteries are included which go right under the magnetized lid. Remotely control the lock: The August app will allow you to have control over all of the functions to the smart lock. You can lock and unlock your door as you need to. It also allows you to give out and take away digital keys for friends and family. You can also monitor the activity at the door through the app as well. Unlimited digital keys: One of the features that August boasts are its unlimited digital keys that can be set for as many people as you need. Door sense: If you want to know if the door is closed or open when you aren’t home then you’ll find this feature very handy. This will help give you the peace of mind that the door is closed and locked anytime from anywhere. Automatic locking and Unlocking: If you set up the smart lock function it will automatically activate upon closing the door. This ensures that your home is safe and secure. Disabling the August app and virtual keys: I always worry about my phone going missing. One of the best features that August offers is if your phone goes missing, you can log into a web browser to regain access to all of your keys and the app to make any necessary changes to ensure you have the account locked down. Easy to use: It doesn’t get any easier to install than this. As I mentioned before you are just changing the inside flip latch on the inside of the door. Your original keys still work and nothing will have really changed from that perspective. However, the idea with this lock is to make it so that you don’t need your keys at all. Integrates with more third-party systems. If you’d like to see more, here’s the link to it over on Amazon. August Smart Lock Pro is very similar to its HomeKit version previously mentioned. Essentially it can modify most existing deadbolts with August’s patented technology. In my opinion, it’s one of the best smart locks on this list due to it’s well-made design, extremely easy installation and it’s overall compatibility with other smart home devices. It really is what the average consumer is looking for in a smart lock. The August smart lock is a purely designed and stylish lock. It comes in Dark Gray or Silver. The app is straight forward and organized in an easy to understand manner. Some people might find the design a bit big, but I found that it fit my needs quite well. Installation: I found the installation of the August smart lock pro to be relatively easy. But just like any other smart lock, be sure to bring a measure of patience along with you. Also, make sure that you check the compatibility of your deadbolt before you go to install it. August actually has a compatibility list where you can check for yourself before you buy. You’ll need to install the August connect app in order to use the lock, but that’s a relatively simple task and I’m sure most people would find it easy to use. August says that the device (which is powered by 4 AA batteries) will last up to 6 months if the lock installation has been done correctly. The problem here is that there’s no way to monitor the battery life. Smart Alerts: Smart alerts inside the August app give you the opportunity to set up “alert me” notifications. Door sense: As previously mentioned with the HomeKit version. If the door is closed or open it will alert you. August Keypad and doorbell: The August Smart Pro allows all August-branded accessories in your home to communicate. For example, it will work with the August Keypad and August Doorbell. The weatherproof August Smart Keypad allows you to access your home using a keycode, no app needed. If you’d like to check out more about the August Smart Lock Pro and Connect features, you can find it over here on Amazon. The first generation of the Kwikset Kevo was launched in 2013. It was one of the first smart locks but lacked android support. This forced Kevo to offer a better second-generation lock, enter the Kwikset Kevo Contemporary smart lock. With a fresh design along with and compatibility upgrades for smart home users; the Kwikset Kevo Contemporary entered the market. One thing that remained the same however was the price. Kevo is different than August in that it comes with its own front and back door fittings. Kevo contemporary is one of the more stylish and solid designs for a smart lock that I have seen on the market. You can even find it in four finishes; Venetian Bronze, Iron Black, Satin Nickel, and Polished Chrome. The Kevo Contemporary has a square faceplate with an integrated LED strip that makes you feel right at home, but with a touch of technology added in. The Kevo is eye-catching for sure and appears to be well built. It weighs 3.5 pounds and has fair dimensions of 5.87 x 10.3 x 3.74 inches, so it can fit into just about any standard door and it takes only 2 AA batteries. The Kevo Contemporary includes Kwikset’s Bluetooth touch-to-open unlocking technology. Basically, this gives you the ability to use your phone as a key when you are within the Bluetooth range. The Kevo Contemporary also offers aKeys that you can give out to guests as necessary and allows you to see who’s been coming and going. My friend who has been a locksmith for over 40 years has told me that Kwikset hasn’t been something he would typically recommend, unfortunately. Mostly due to the lack of Kwikset quality in his own experiences with Kwikset locks. But I feel that I can add it here as it provides a lower cost option for homeowners who may not want to shell out the money for something more high end. Installation: Kwikset has really tried to make the instructions very easy for the everyday consumer to install and for that, I give them kudos. They even included coded packages for the screws and provide you with extras in case you lose one. Security features: Kevo contemporary locks and unlocks by simply touch the Kevo’s keyhole as long as you have your phone with you. As seen in the video above the Kevo’s status LEDs will start blinking and then you gain entry. You can also check the current status of the lock inside the Kevo app to see if it is locked. Smart home integrations: I found that Kevo integrates extremely well with all kinds of different smart home devices like Amazon Alexa, and Ring Smart Doorbells. But if you want to make it work with your other smart home devices you’ll need the Kevo Plus gateway. If you’d like to read more about the Kwikset Kevo, you can check it out over here on Amazon. There are so many great smart locks on the market right now, and many more to come I’m sure. We have seen an explosion in smart home security technology and the integration between companies is ever expanding. I don’t have a cookie cutter definition of what the best smart lock is. From my experience, it’s rather subjective and purely depends on what kind of security you are looking for and what kind of money you are willing to spend. I hope that this article has given you some keen insight into what the best smart locks on the market are right now.